The harbour at Schooner Bay Village is the only harbour of refuge along the coastline from Little Harbour/Cherokee Sound to Hole in the Wall in the south. Coming from the north it is 7.9 NM from the waypoint OFFCHS to the waypoint SCHOBY. To enter from SCHOBY proceed due west along latitude line 26° 10.5’ N (278° M). Pass between the red/green buoys and proceed further west to the single green buoy. Then turn to port and head for the harbour entrance between the rocky point on the east and the breakwater and sandy beach on the west. This course will hold you off the shoals extending from the offshore rock and the point to the east of the marina entrance. Controlling depth is 8’ MLW and the harbour can accommodate vessels to about 80’. Featured on the cover of Coastal Living magazine, the Schooner Bay Beach Cabana showcases the design of traditional Bahamian architecture. A memorable oceanfront retreat, the Beach Cabana takes full advantage of the gentle ocean breezes as it overlooks an expansive stretch of pink sand beach to the north of the Harbour entrance. 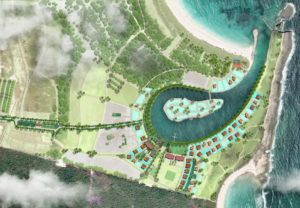 The outdoor summer kitchen and oceanfront setting are a cherished destination and plans are underway to build a full-service Beach Club adjacent to the Cabana, including a swimming pool, tiki bar, sun deck and waterfront fire pit. Bonefishing in the Bahamas has reached near cult status among fly fishermen in recent years and Blackfly Lodge gives the serious fly anglers another incredible destination to pursue their sport. Although flyfishing in Abaco is the most common way anglers catch bonefish, Blackfly hosts many spin fishermen throughout the year. This is a very private and exclusive fishing excursion that many have said is the best fishing experience they have ever had in the Bahamas. After reading the testimonials from recent guests on the Blackfly website, you’ll be reaching for your bags, tying new flies and making your plane reservations. The lodge accommodates up to 8 anglers fishing for 2 to 7 days per week, each with their own private bath and room, 2 anglers per boat. In the evenings, anglers gather around the fire pit to share the day’s adventures. Overlooking the Harbour Village waterfront, Sandpiper Inn and Cottages is the newest and most unique destination in all The Bahamas. The traditional Bahamian Inn and great house recently began welcoming guests to Schooner Bay. The full service Inn also includes a restaurant, bar, library and gardens, providing a welcome retreat for visitors exploring the adventures of the southern Abacos. Located adjacent to the prestigious Blackfly Lodge, Sandpiper Inn is the social center of a village–a place to gather and enjoy authentic island life.